Mastered molecular interactions lead to performing products. Our solutions improve your developments. evaluate them with Inverse Chromatography. Small surface modifications of a material (powder, fibre or plate) impact its interaction potential and can therefore have a drastic impact on its properties and performances. The surface chemical composition and the surface morphology are generally determined by different techniques. However, this information does not describe how far the interaction potential is modified. Our services and know-how in the inverse chromatography techniques provide you this knowledge about the surface interactions. This opens an easier and smart way to master and control the surface characteristics of your materials in order to increase their added value. Knowing the chemical composition of the surface and having micrographs of the surface is not sufficient to gather information on the interaction abilities. Adscientis provides this information, thanks to its expertise in Inverse Chromatography. Our methods are based on the direct measurement of the interactions occurring at the surface of the materials with molecules acting like probes. The multiplicity of the used molecular probes allows a complete description of the interaction potential of the material with the fast determination of numerous surface characteristics like the surface energy, the surface nanoroughness, the acid-base character and the surface heterogeneity. It becomes possible for you to finely tailor the surface properties. Many application fields are concerned. Contact us If you want precise information specific to your needs, we would be happy to help you. This quote of Wolfgang PAULI (Nobel prize for Physics) illustrates the intrinsic complexity of the surfaces and their properties. Indeed, the surface of a material is evolutive, able of ageing and changes with its history (synthesis and storage). Obviously, this influences the behaviour of the material during the application. For example, in the case of a silica sample, characterized before and after ageing (3 days at 40°C and 80%RH), huge differences are observed. Indeed, the measured surface energy decreases from 68 to 30 mJ/m2 with ageing. Moreover, the chemical surface heterogeneity investigated with isopropanol increases too. 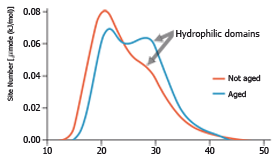 Ageing generates new hydrophilic adsorption sites. With such different surface properties, the aged and not aged silica behave drastically differently when melt with PDMS. The obtained rheological properties are reflecting some incompatibilities for the aged sample. The measurement of the surface energy is therefore a good tool to prevent such situations.